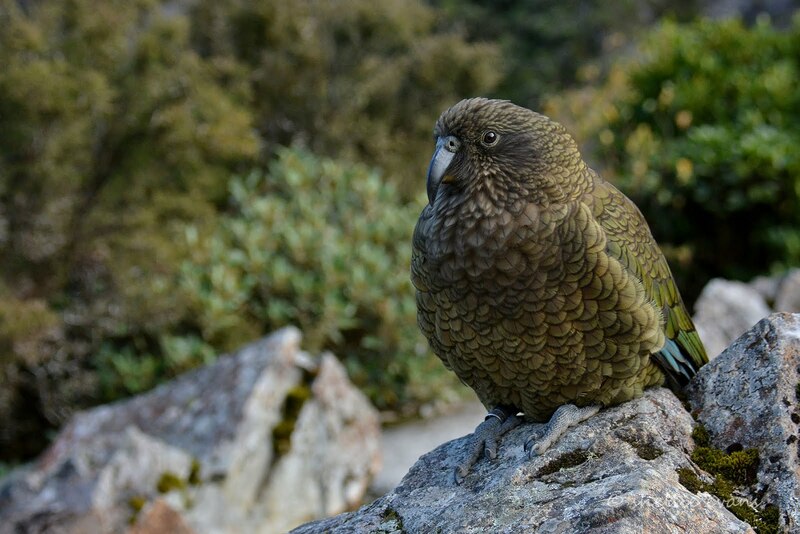 Just a short blog post to let my regulars know that, rather than thinking we've disappeared off the face of the earth for the next week, we'll be enjoying ourselves at the Lake Kaniere DOC camp. Lake Kaniere is 22kms inland from Hokitika and I'm thinking that there won't be any cell phone reception there. After three mostly wet days at Punakaiki, we decided to head straight to the lake and get settled in there with a good site before the rush that'll probably happen over Easter. 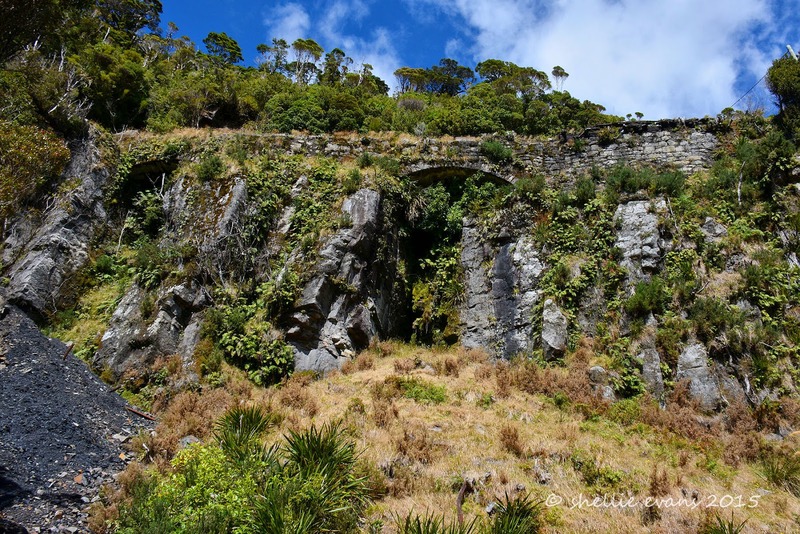 Don't worry though, I'll resurface with a whole heap of blogs to catch you up to date, and some especially good ones too, of our visit to the Oparara Basin Arches north of Karamea and our time at the end of the road, Kohaihai. Here's a taster; the Mirror Tarn at Oparara Basin. Happy Holidays everyone, have an enjoyable & relaxing time, safe travels, and hopefully we'll all be able to catch the last of the summer sun (or some spring sunshine for those in the Northern Hemisphere). Well, it was for four of the five days we stayed, the other day it was torrential rain which we were very grateful for; our vehicles needed a good wash down, they still had a salt covering from the storm that blew through when we were at Ward Beach three weeks ago. And with no water available at the NZMCA Park it was great to be able to put our collection containers out at the end of the awning and fill the water tank and our spare carry containers. This saved David at least one trip into town to fill them at the Countdown potable water tap (which is near the dump station which we couldn’t use as it was tucked into a corner). 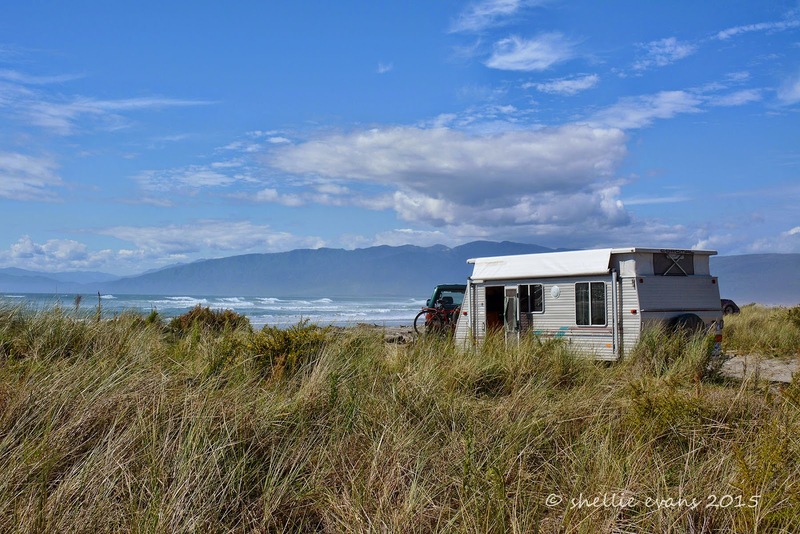 In amongst the dunes beside the NZMCA Park is a freedom camping area that had at least 6-10 vehicles parked up every night; mostly hire motorhomes & sleeper vans. There’s not too many places in New Zealand where you’d be able to park overnight right on the beach like this, some visitors from overseas might think they’ve died and gone to heaven when they pull up on such a beautiful beach. 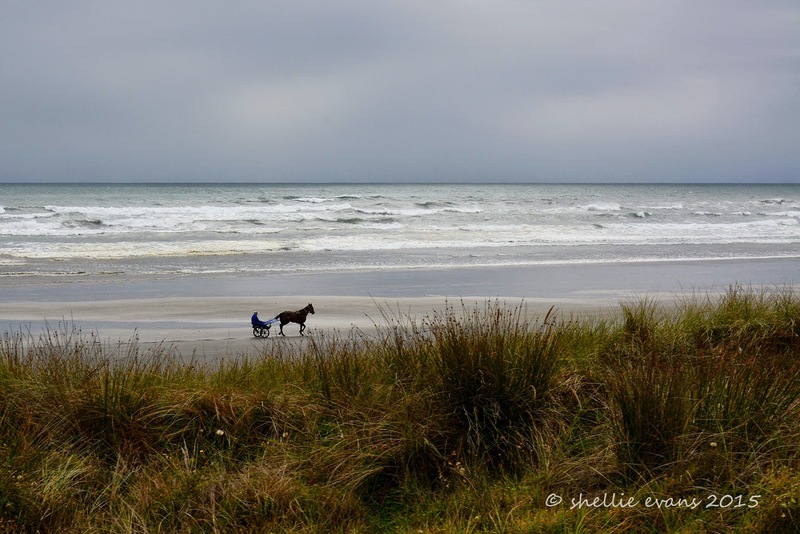 Westport’s NZMCA North Beach Park from the beach. 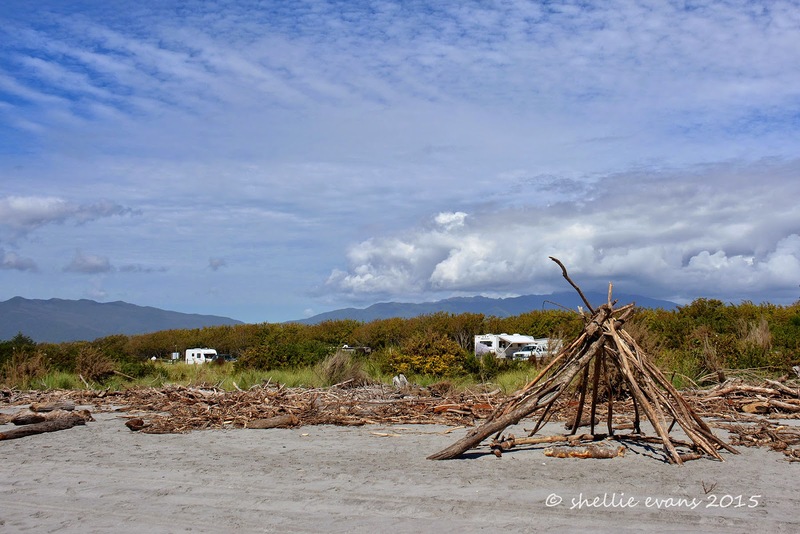 The tepee, I think, is courtesy of the Kiwi Experience Bus passengers; they come here for a sunset bonfire & drinks. 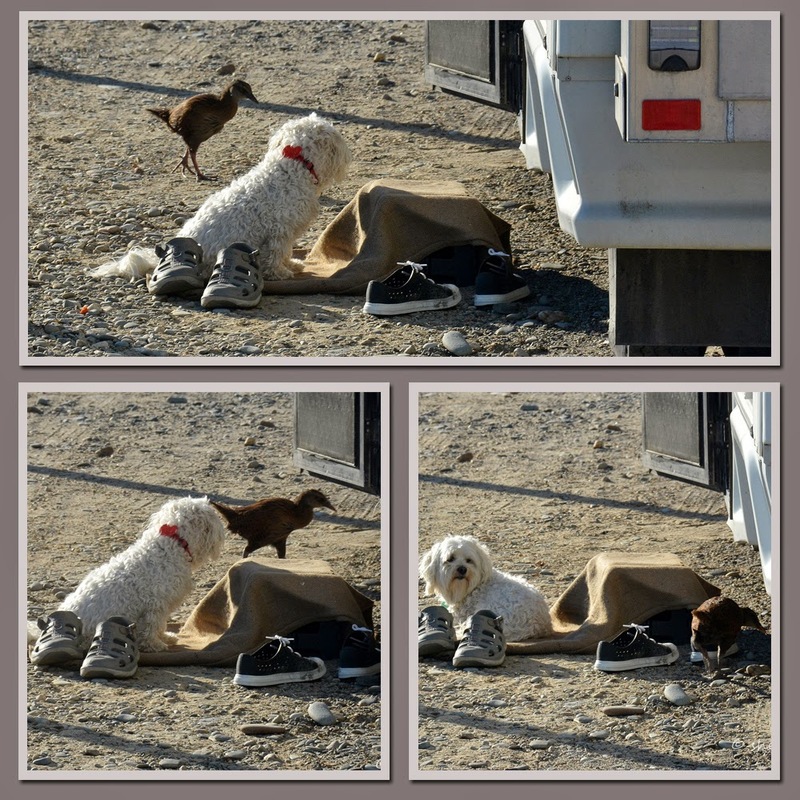 I took these photos especially for our friend Bluey, to show him what a good dog does when a pesky weka comes a calling. This little pooch must have a whole heap of willpower, either that or she’s too scared to move. Bluey, she is a looker, you could be in with a chance if you ever meet & can show her some restraint. When it comes to weka. 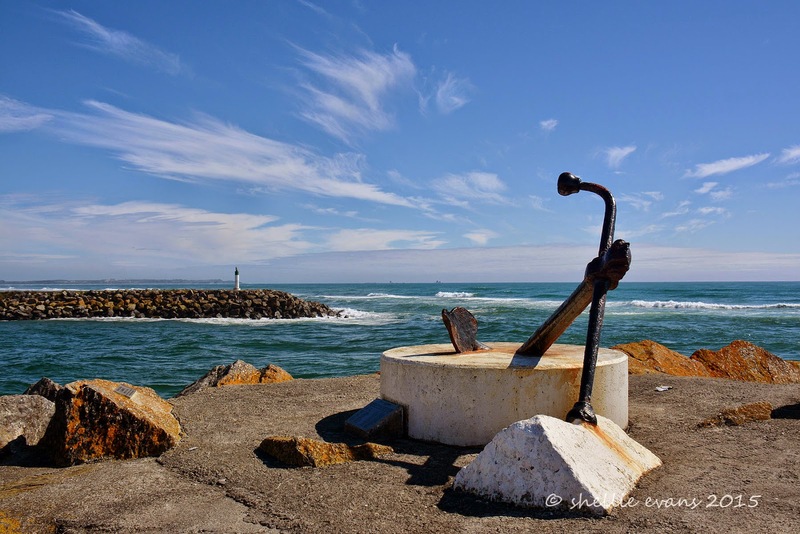 At the south end of the beach is the Buller River breakwater and the Westport Bar, a wild section of water that has claimed many lives and boats over the years. I missed getting a photo of a fishing trawler exiting the mouth as we arrived, there was a large swell and huge waves were rolling in. The boat rode over the top of them, crashing down the other side with sea spray flying in all directions. It made me feel sea-sick just looking at it. Later a very small and cute older fishing boat came up the channel, I was hoping to see it cross over so I could get some photos but it spent about half an hour going round and round in circles fishing for live bait and by the time we left it was still weaving about and the swell had subsided. 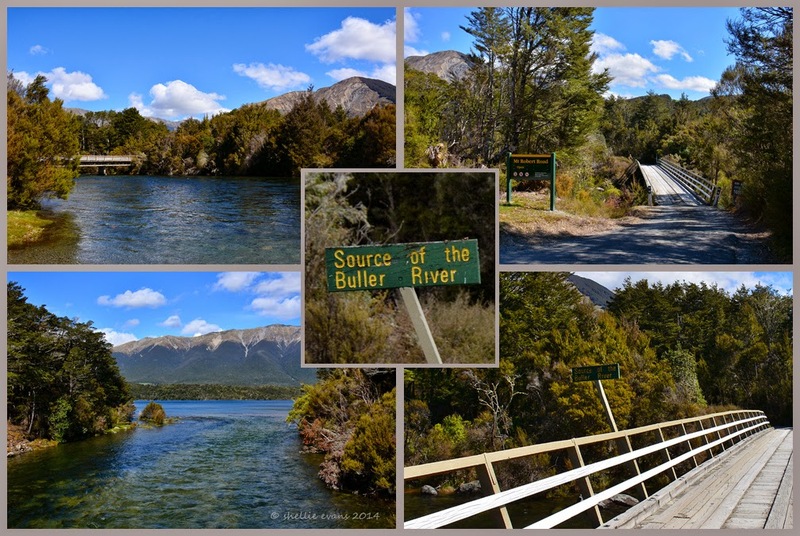 We’ve now been to the source of the Buller on Lake Rotoiti at the Nelson Lakes and to the mouth of the Buller here in Westport. Before the tide turned and the waves settled there were a large number of surfers riding the waves on the north side of the breakwater. There was a lot of white water but a few good sized waves too. I even managed to catch a fish enjoying a wave (top right-it looks like a kahawai). 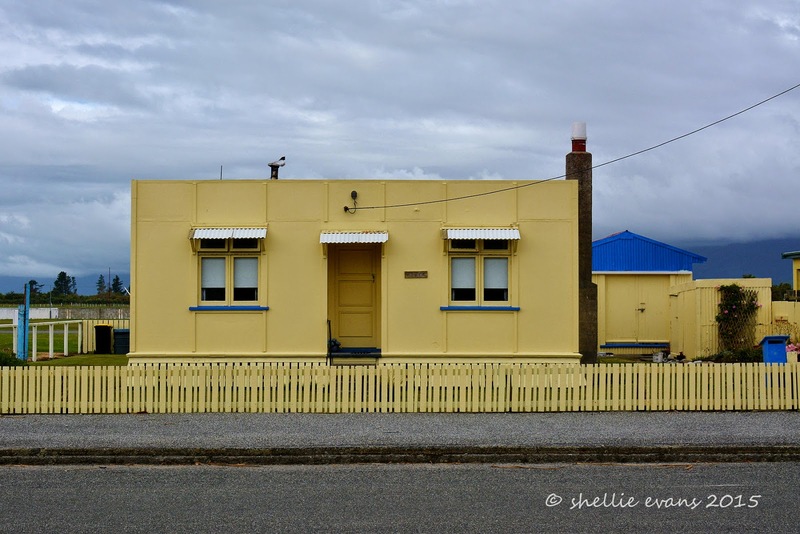 This little house was just down the road from the Park, it looks to have been part of the racecourse at some stage. A little harsh perhaps, but it’s aptly named ‘The Box’. Cute! 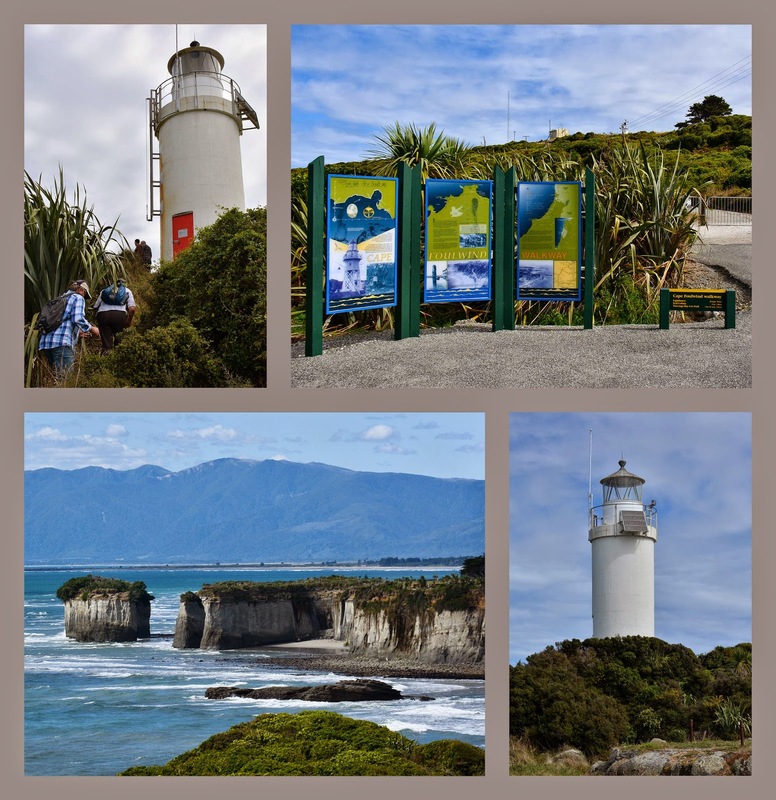 We visited Cape Foulwind, just south of Westport, where there’s a 2km coastal walkway between the lighthouse at the Cape and Tauranga Bay further south, where there’s a seal colony. Nearby are the Gibsons Beach sea stacks, there used to be a huge single stack further out called Giant’s Tooth but it crashed into the sea after an earthquake early last century. We didn’t walk the track, there was a cool breeze blowing, it was getting late & we didn’t fancy retracing our steps to get back to the car afterwards. 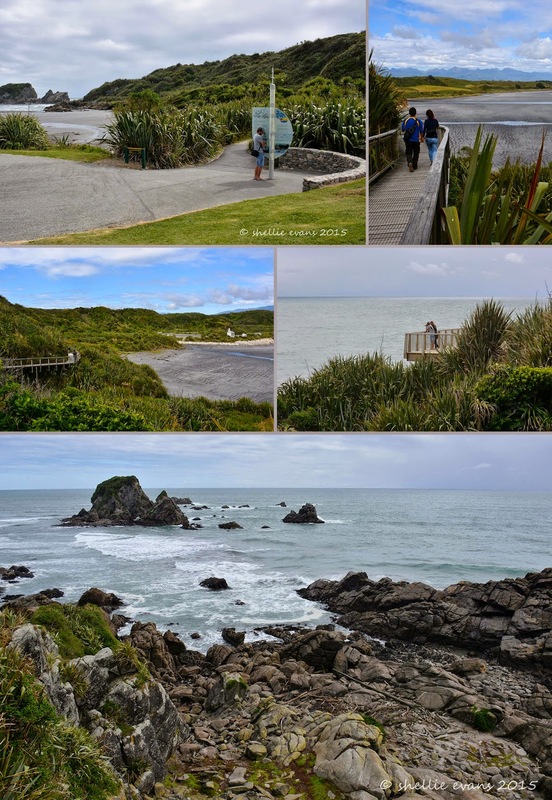 Instead we drove to the other end, to the carpark at Tauranga Bay and walked up to the seal colony. It’s just a short walk to the lookout over the colony where a steady stream of visitors were hoping to catch sight of the seals. 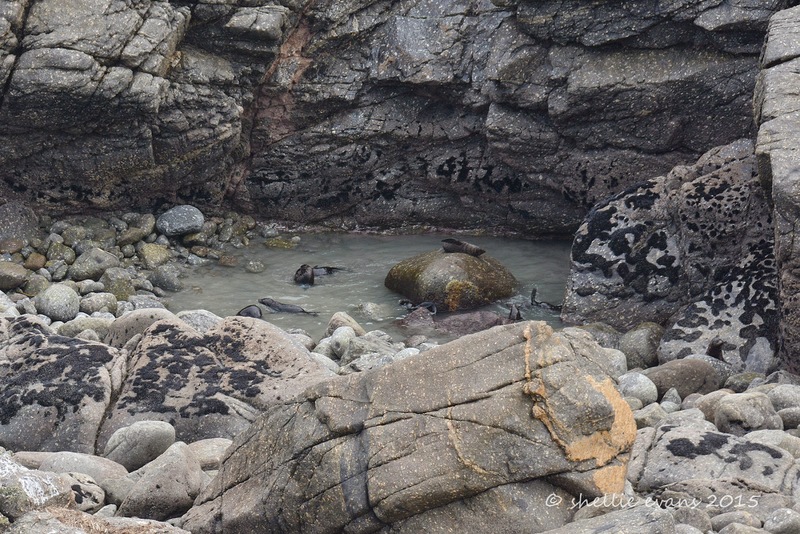 The last time I visited here, many years ago, there were hundreds of seals spread out over the rocks below but unfortunately today there were only a handful of pups playing in a pool while their mothers are away feeding at sea. And if you didn’t have binoculars (like most of the visitors), or a camera with a good zoom, you would have been hard pressed to see them. This colony has nothing like the huge numbers of seals that are in the Kaikoura coast colonies. 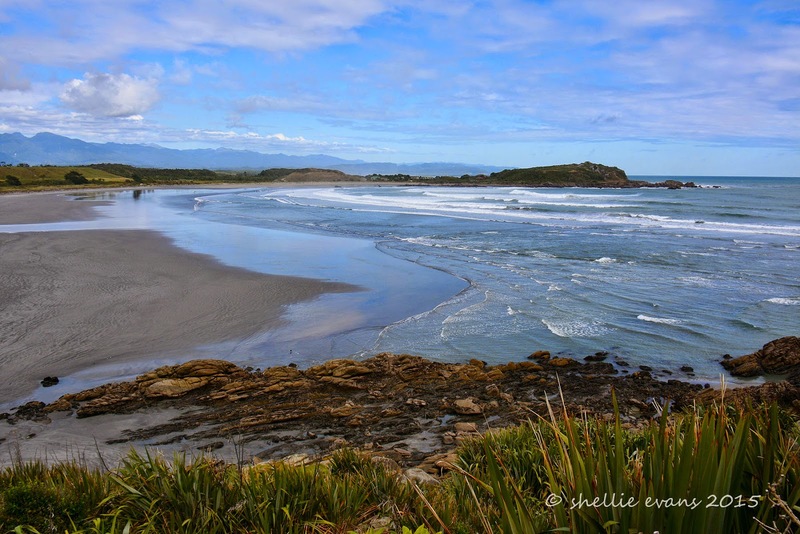 We drove around Tauranga Bay and over to Nine Mile Beach which is a beautiful long isolated sandy beach backed by large dunes covered in marram grass. Today there was just the solitary figures of a horse & sulky rider working out before the rain arrived. 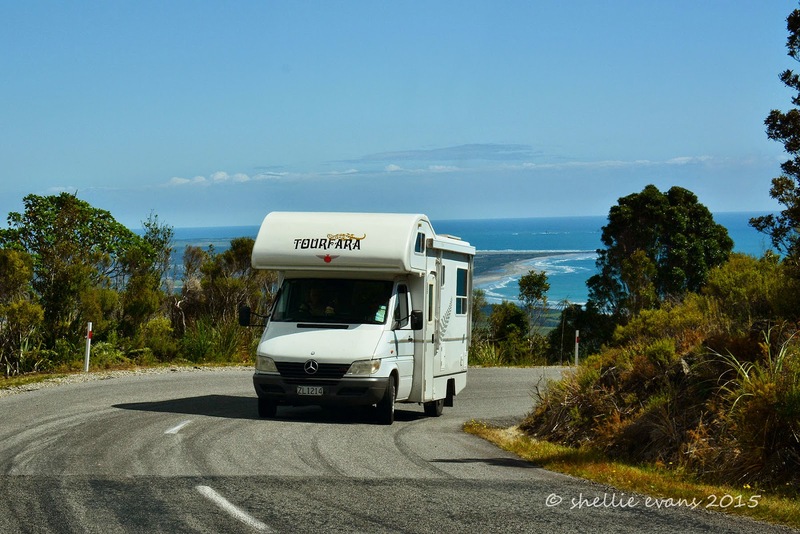 There was one last chore to do before we headed north towards Karamea. 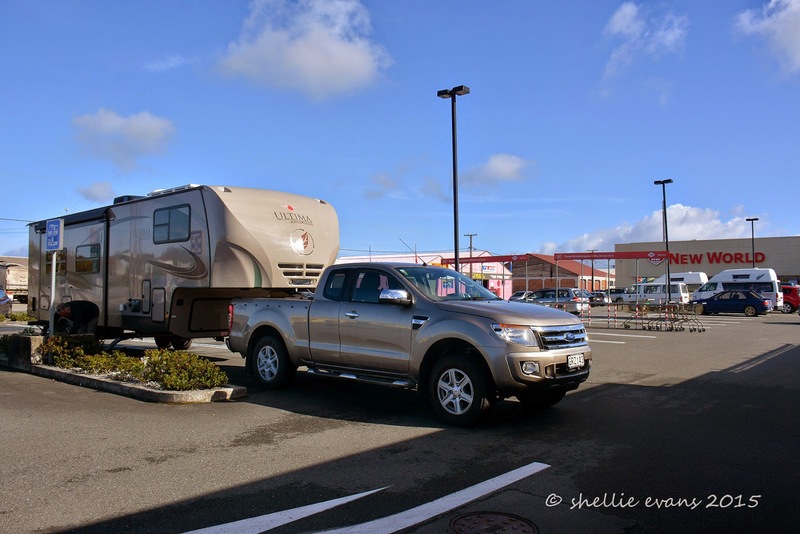 With only two public dump stations in Westport and both of them in the parking area of a supermarket we had to use New World who had the best access. Although they had no potable water so then it was across to Countdown for that. Who in their right mind would team up a dump station with a supermarket? Not only is it a weird combination but also there's the tight maneuvering for bigger rigs inside the car park- especially on a Saturday morning. I guess the supermarket came up with the idea, hoping we’d buy our groceries there while we dumped (and we did). In one door, out the other! 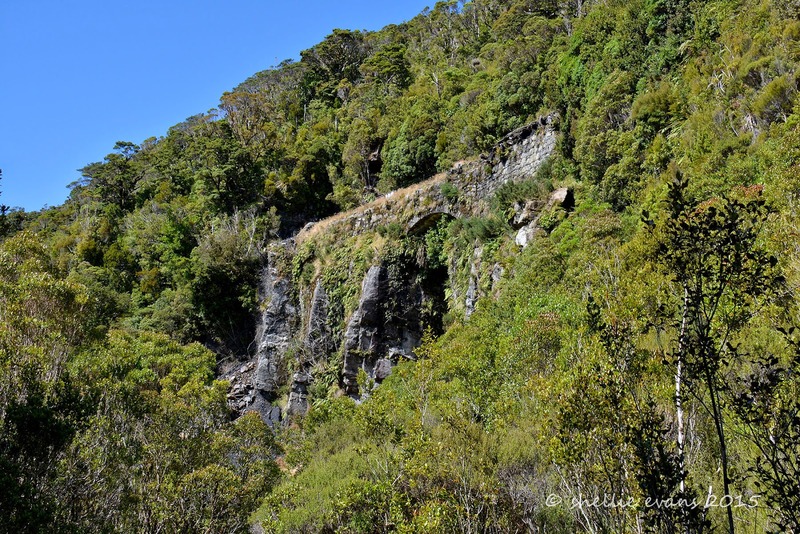 We followed the track away from the Incline area passing through regenerating bush on our self-guided walking tour. It’s along this steep bank that the Camp took shape. 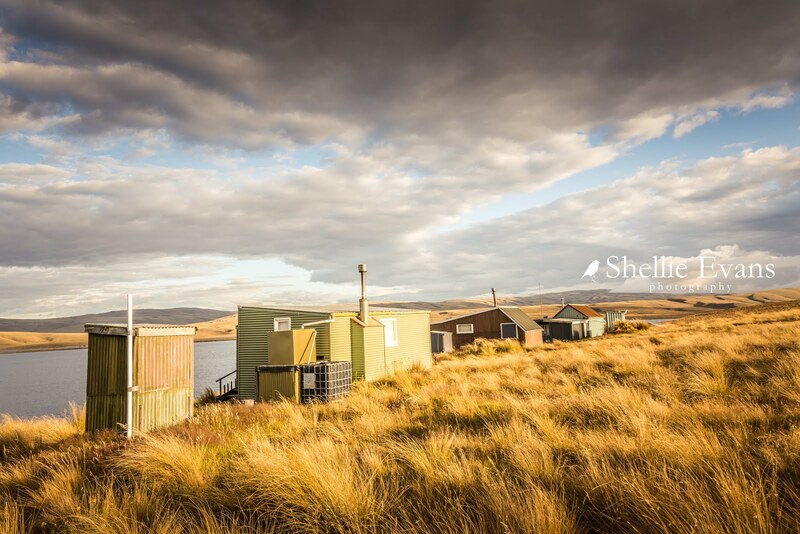 There was no order; shacks & huts, some still half canvas, sprouted wherever their owners decided. There were no roads either, just a track down to the Camp then winding paths between dwellings. 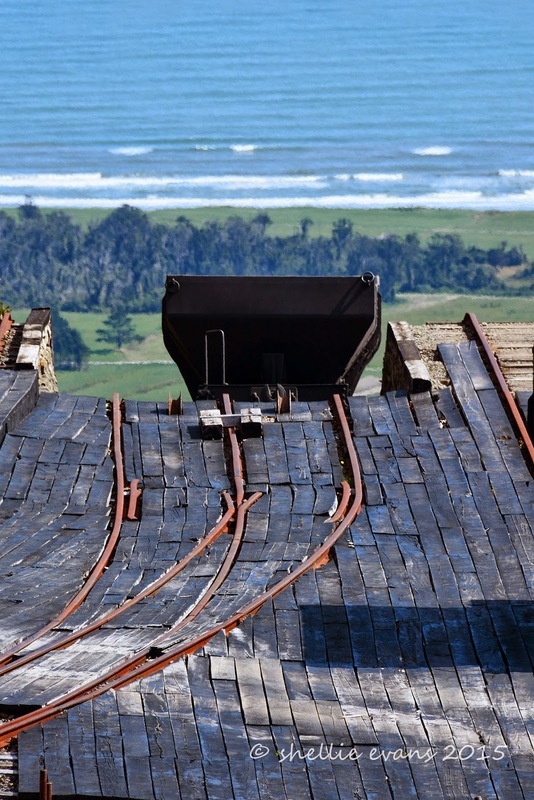 A few sturdier chimneys still stand…. ….elsewhere iron and rubble from buildings has been pushed over the side, left to weather and eventually rot away or be overtaken by the slowly encroaching bush. 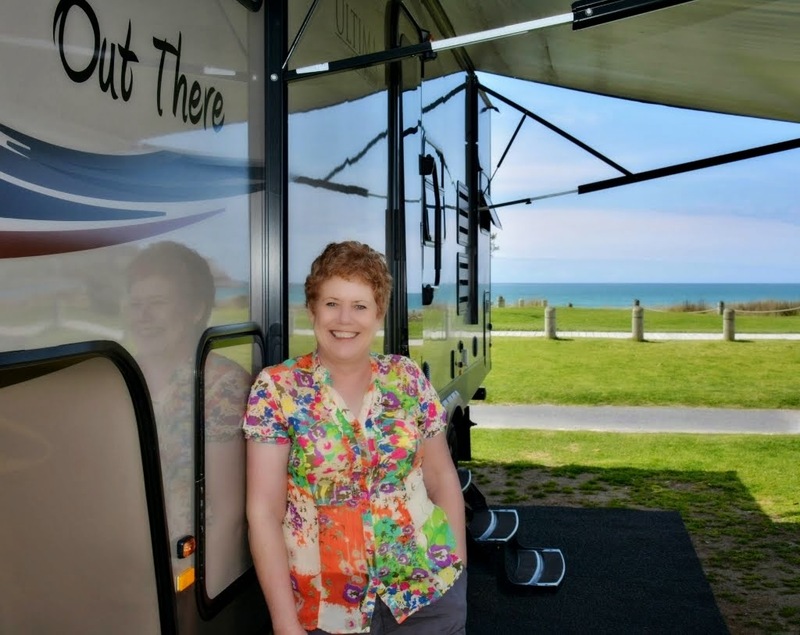 I spoke to a old-timer who was manning the information kiosk where ‘The Denniston Experience’ tours depart from. He told me that all the management houses and camp buildings were demolished when the Incline was closed because they were worried that squatters (or his words, ‘a commune of hippies’) would set up camp in the empty buildings. 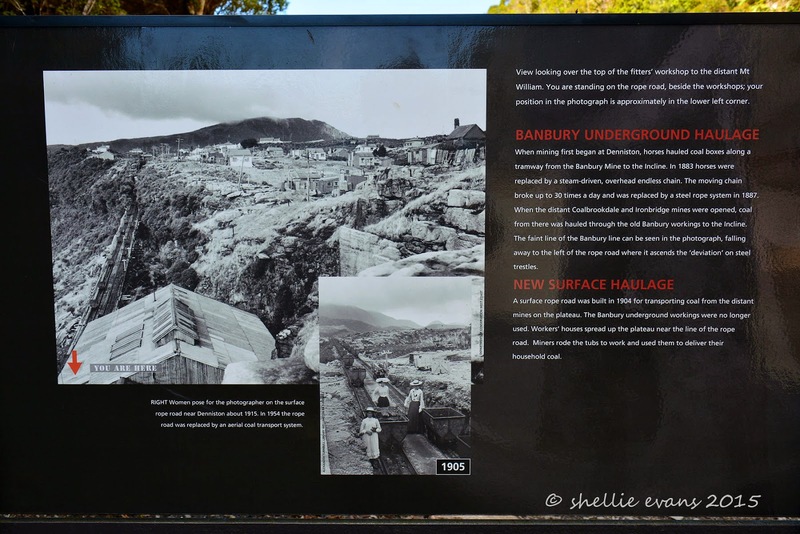 The track eventually led to the Banbury Arches; a dry stone wall bridge and tramway that carried coal from the Banbury Mine (1879-1890) to the Incline. 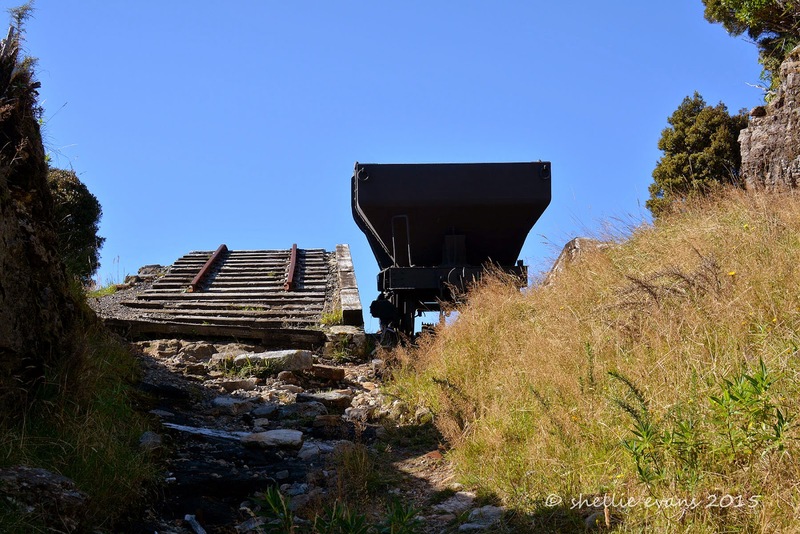 This mine was one of the first mines to open on the plateau but after a few years it was used as an access tunnel to the bigger mines behind it, bringing their coal through the mine and on to the Incline. The Banbury Mine entrance (the dark patch) can be seen just to the left and above the smaller arch. 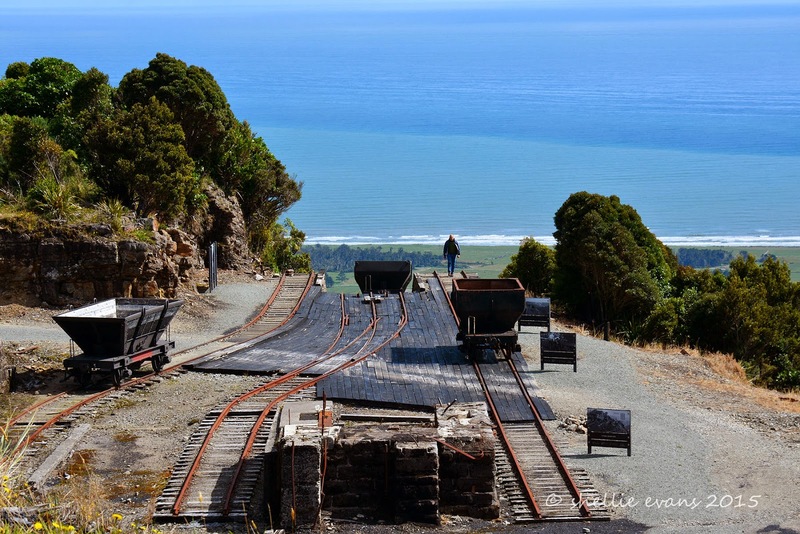 In the early days horses were used to haul the tubs of coal to the Incline, nowadays the Denniston Experience tour uses the mine & tramway for their small rail carriages, taking people into the mine on a ‘real miner’ experience. 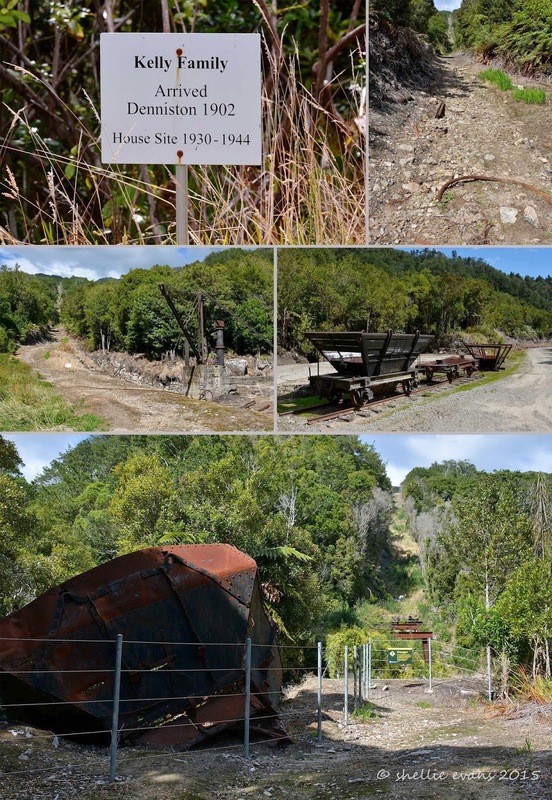 Originally the mine was only 1 metre high, it has now been increased to 2 metres. Which is just as well, as I’m sure there would have been many suffering from claustrophobia. 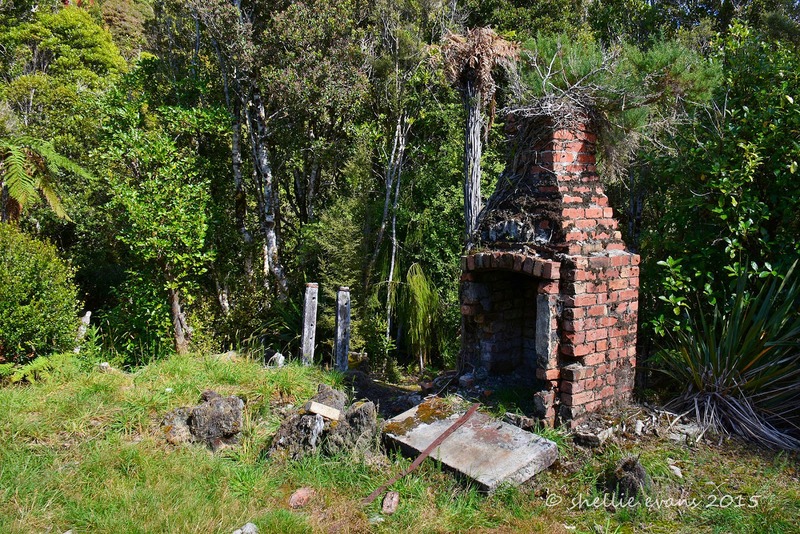 The chimney in the photo below belonged to the smoko shed and it was here the men (& boys) working nearby used to warm their hands on cold winter mornings. We’re approaching the level above the Incline where the rope road haulage engine was located. 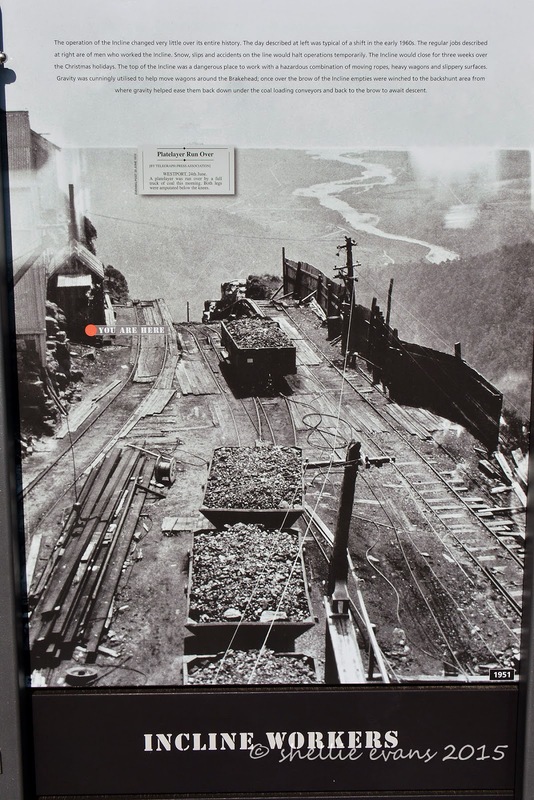 The engine pulled the rope that hauled the coal tubs from the distant mines of Burnetts Face. 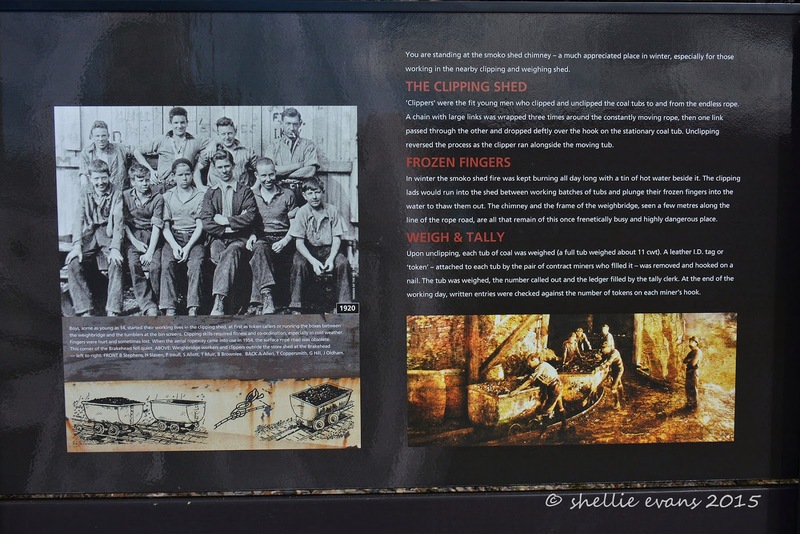 Boys as young as 14 started their working lives here at the clipping shed, clipping and unclipping the tubs of coal to and from the endless rope. 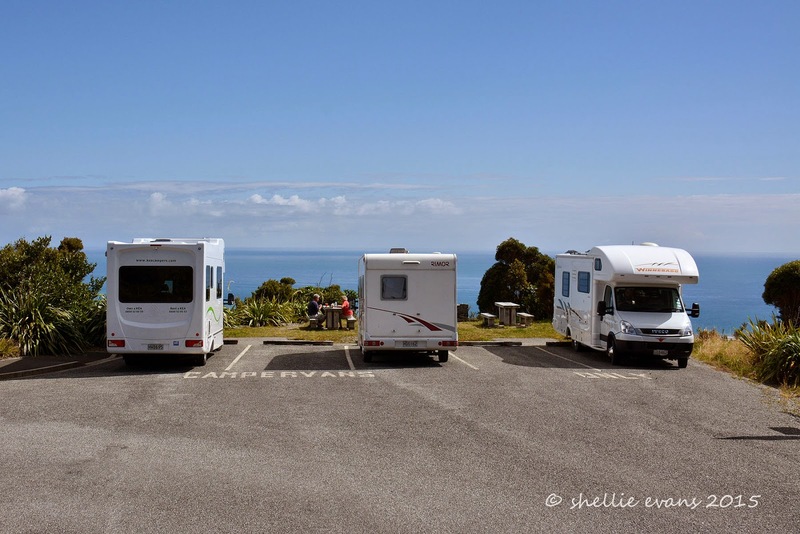 We come to the end of our walking tour and find a table near the motorhome parking area, overlooking the Incline and that fabulous view, to have lunch. We’re joined by a small party on a cycling tour of New Zealand. That's my idea of a cycling tour; they cycle small sections of the journey- the interesting bits- then the bikes and passengers are carted up and/or through any difficult parts. This group were about to ride the Denniston Plateau road- down, all the way! 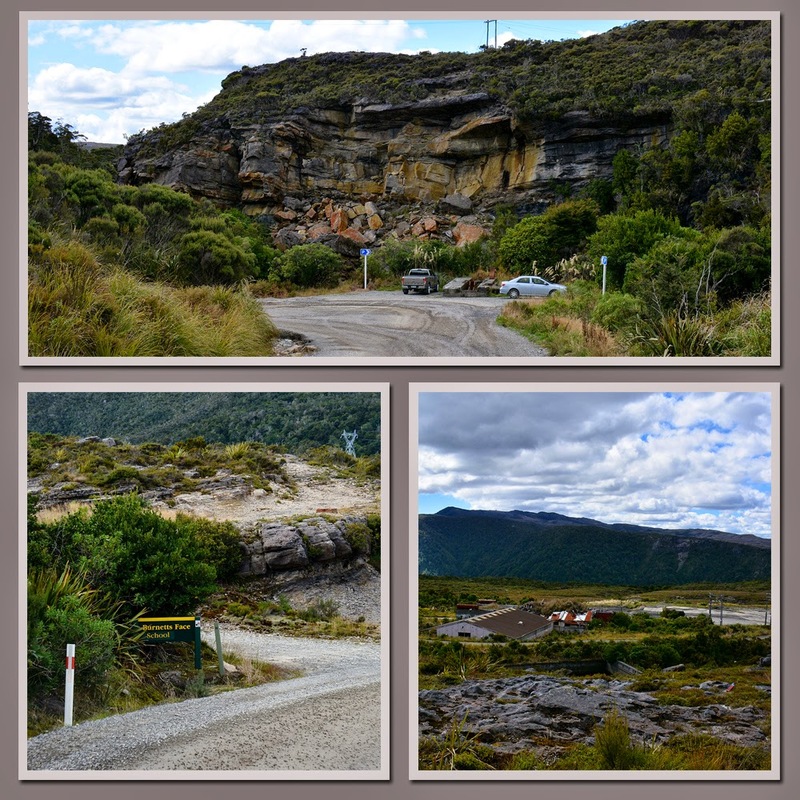 After lunch we drove further on into the plateau to the old Burnetts Face, passing old historic mining sites along the way. There were a number of townships along this road; Denniston, Burnetts Face, Coalbrookdale & Marshvale (also known as Pommy Town). Burnetts Face School was located near the DOC sign in the photo, bottom left. Now it's just barren rock and scrub. 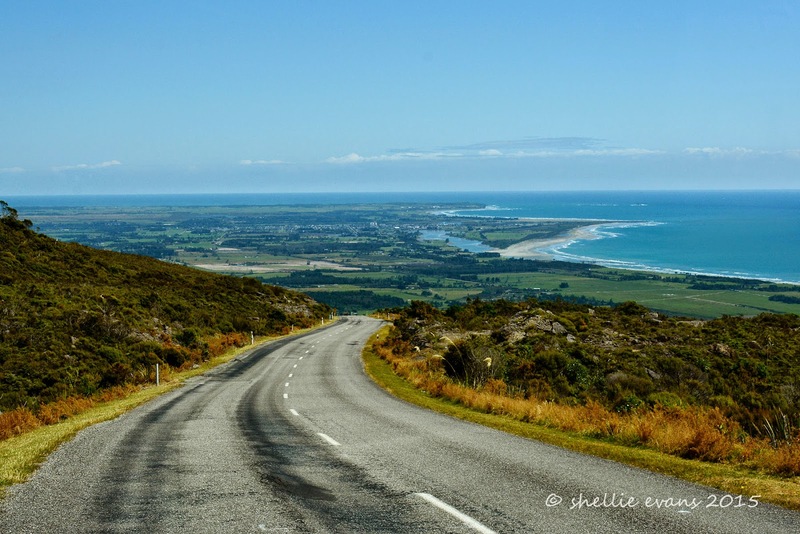 Then it was back down the winding road with the perfect view out over Westport with Cape Fourwind behind. I can even pick out the NZMCA Park on the beach- the white speck in that second curve of the first bay. Once at the bottom we make our way to Conn’s Creek to look at the Incline from the bottom of the bluff…. …along with more mining relics. 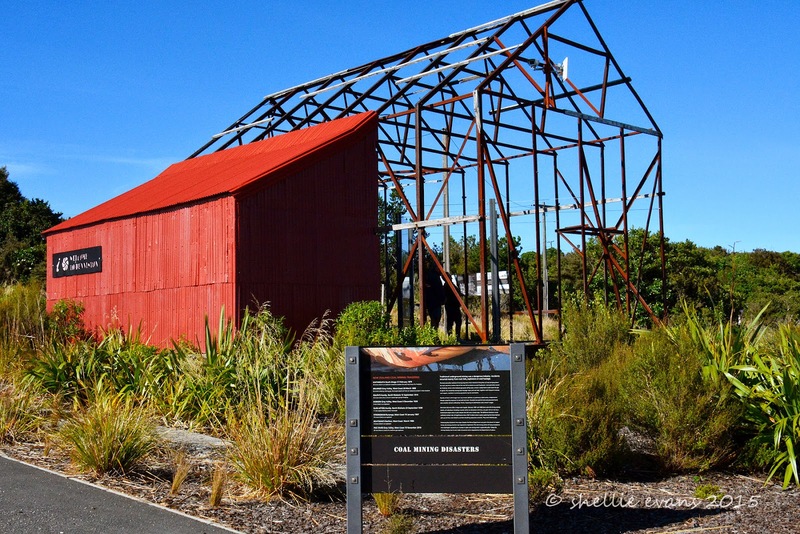 Located around the plateau and down the road are a number of signs from the ‘Friends of the Hill’ museum, showing where houses were built and information about some of the people that settled on the plateau. I climbed up the first short section to where the creek crosses underneath and where part of the Incline had been washed away. 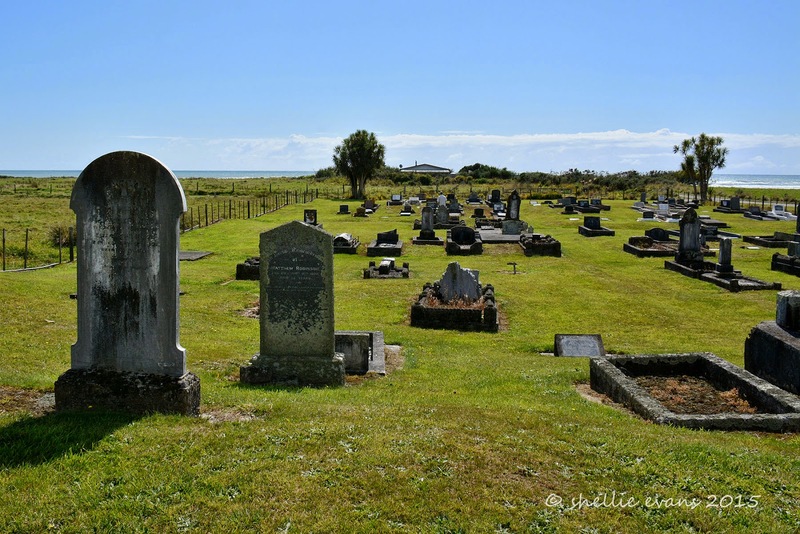 Our final stop was out near the mouth of the Waimangaroa River, at the Waimangaroa Cemetery. 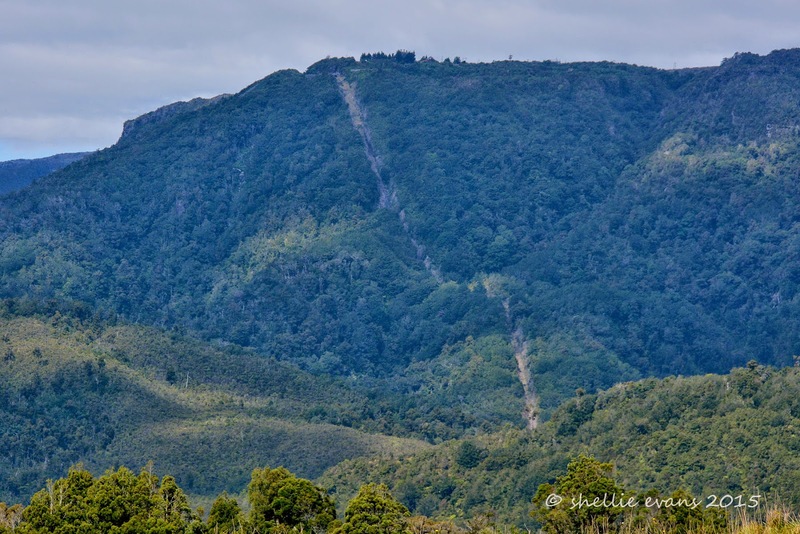 The cutting of the Incline shows clearly from a distance. 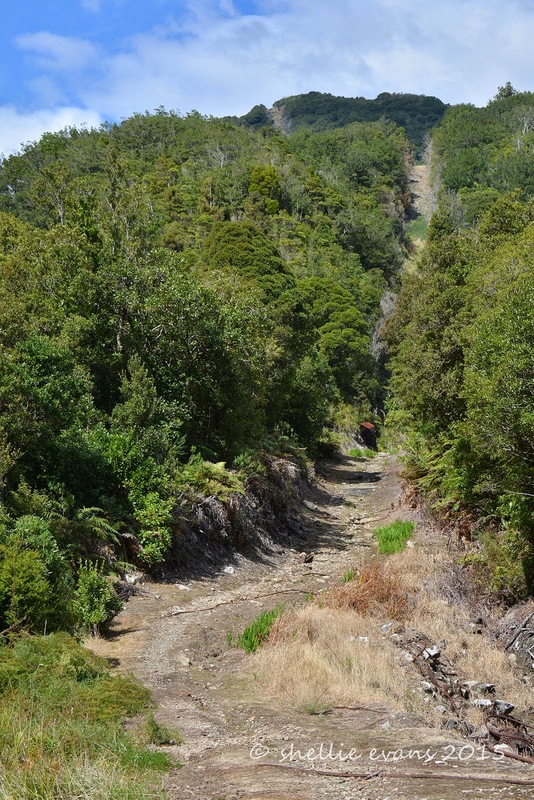 I hope they always keep the line clear, it would be a shame to loose the impact of the cutting to the regenerating bush. The rock on the plateau was too hard for digging graves, many of the people that lived and died on the plateau are buried here. In the early days the coffins with their precious cargo were sent down the Incline, the only way to get them to the bottom. In the shadow of the Incline. Often the loved ones could not be at the burial or visit afterwards. After their initial ride up the Incline, they had a fear of riding it again. Many never left the Plateau alive again. 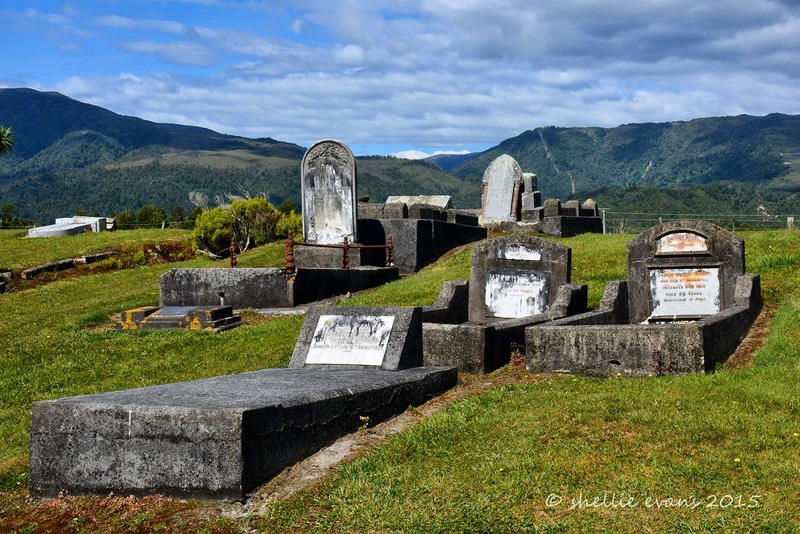 The final resting place for many of Dennistons’ brave & hardy residents, overlooking the West Coast’s wild Tasman Sea, although on this day it’s calm and serene. 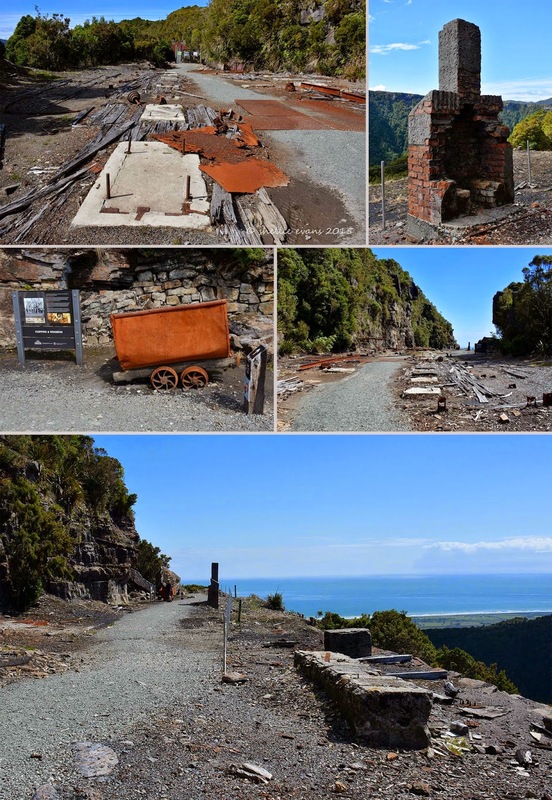 The Department of Conservation, with the help of many volunteers & workers has done an amazing job in restoring and bringing alive the Denniston Plateau, and in particular the Denniston Incline, what a wonderful tribute to the men & women who eked out a living and survived the harshest mine site in the country. 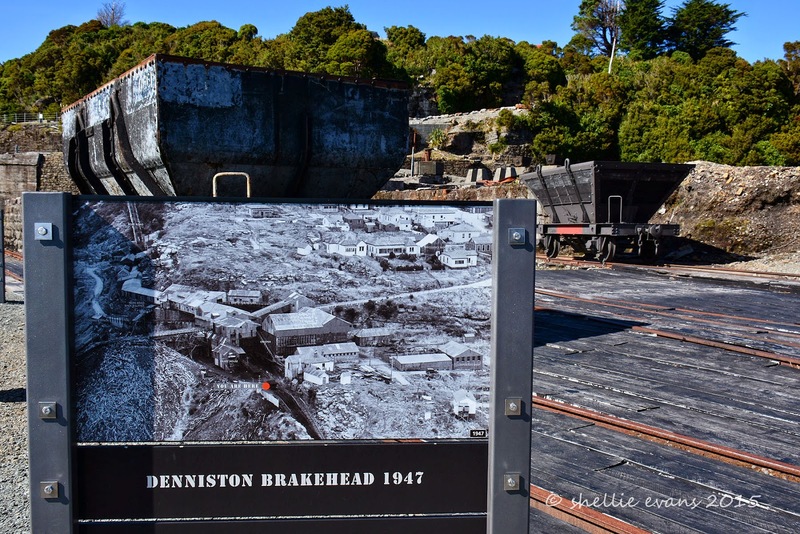 Ever since Mum & Dad gave me the book ‘The Denniston Rose’ by Jenny Pattrick for my birthday back in 2003, I have been waiting for the chance to visit the historic coal mining site on the West Coast. 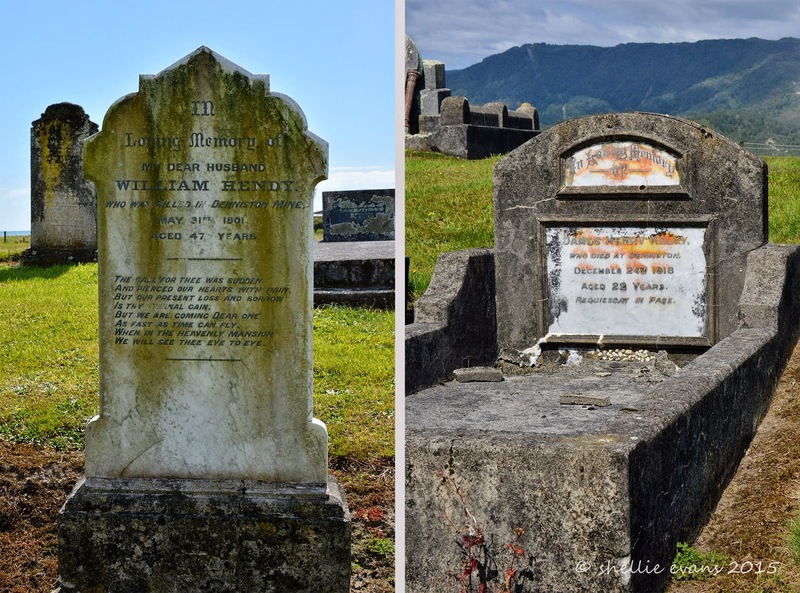 The novel, based in the 1880s, is about a young girl, Rose, & her mother who lived in appalling conditions, along with mine workers, in their makeshift collection of huts, tents & saloons in the bleak & isolated coal-mining settlement of Denniston. 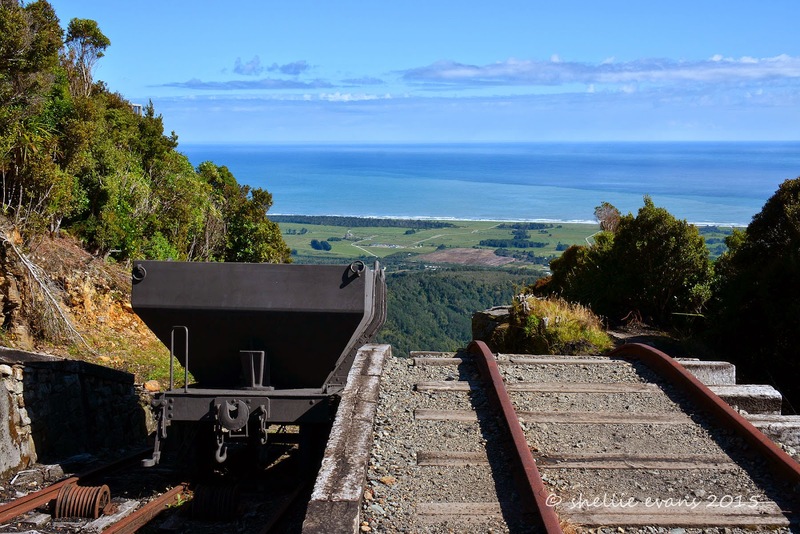 Denniston is located high up on a plateau where the only access was by a steep bridle path or by riding the coal wagons up and down the terrifyingly steep Denniston Incline. The people in the novel are fiction but the events and conditions are historical facts. 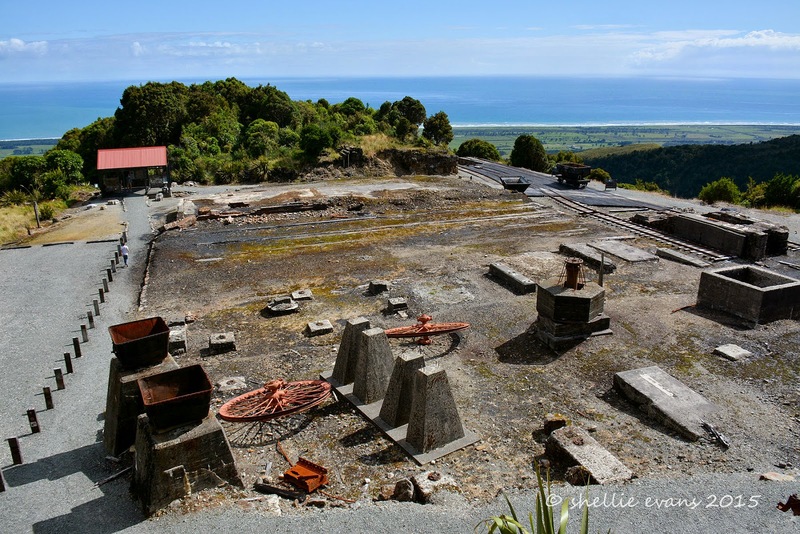 Between 1879 and 1967 the greater Mt Rochford Plateau mines were New Zealand’s largest producing coal mines, producing an estimated 12,600,000 tons of premium quality coal. 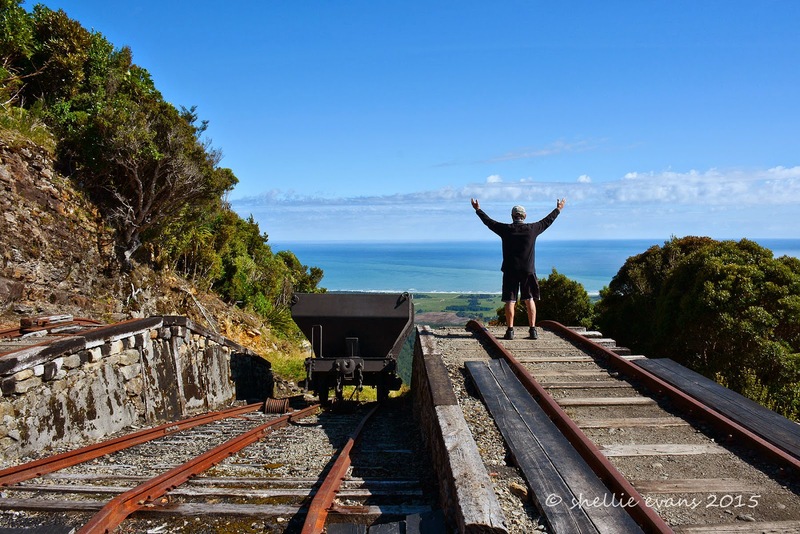 Once the coal reached the Denniston Plateau it was loaded into railway wagons and lowered by cable down the steep incline railway, the famous “Denniston Incline” (referred to as the eighth wonder of the world by locals) and a remarkable feat of engineering & industrial innovation. There is now a 9km steep, winding and narrow road to the top of the plateau, a road that is shared by many coal trucks coming and going from the Bathurst Opencast Mine which is located further back on the plateau. The trucks have radio contact with each other and wait patiently for any larger vehicles making the ascent. I hoped for a fine day. In fact we probably wouldn't have visited if it was anything but a fine day- the view seaward is spectacular and part of the experience. The weather up on the plateau is notoriously bad and it’s often shrouded in mist, fog and cloud, or all three. Then there’s the snow, wind and rain. Luckily we had a gloriously fine day. 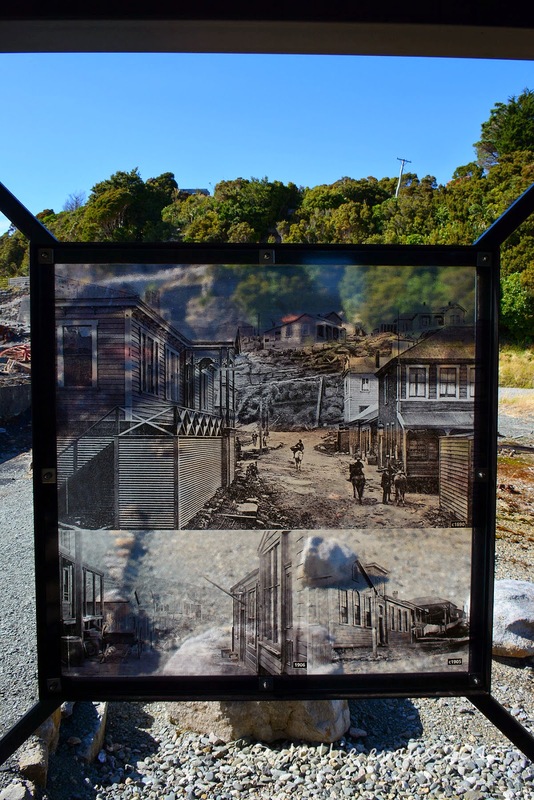 While the historic Incline has always been a point of interest, in recent years the Incline area has been upgraded & restored. 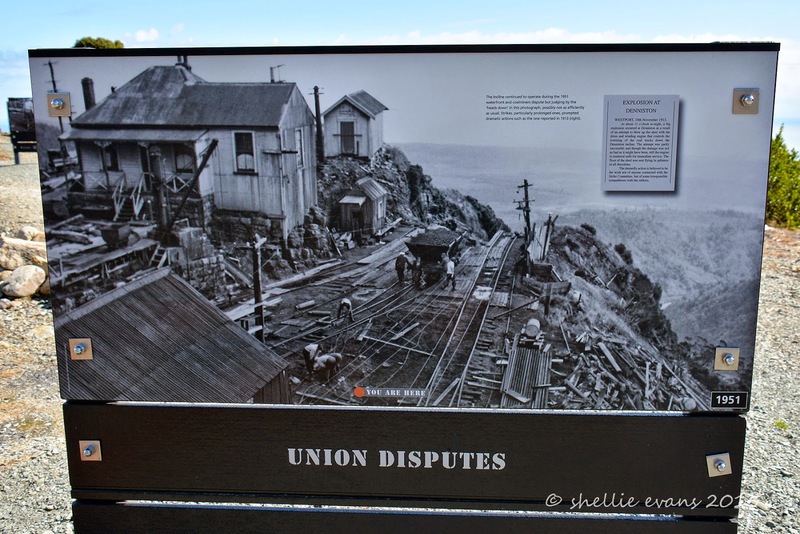 A path leads visitors past old machinery, mining relics, rail lines, the brake head, hopper wagons and building remains with many informative interpretation panels along the way. 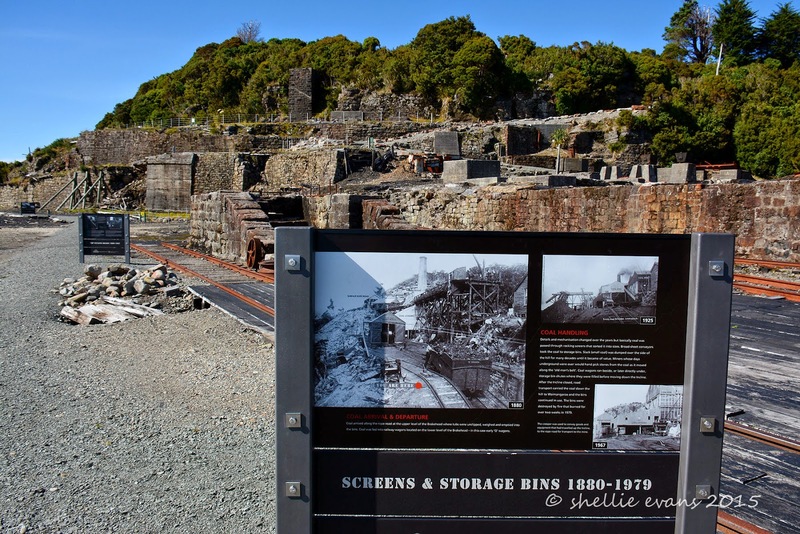 The building above was once the workshop, it now houses comprehensive information panels about the lives and times of the people living on the barren & windswept Denniston Plateau. It’s where the start of the self-guided walking tour departs from. 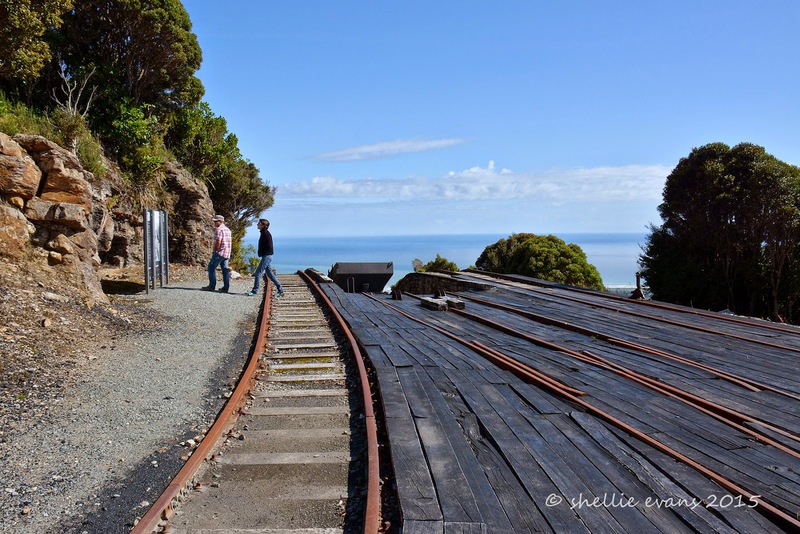 After giving the old mining gear on the top level a cursory glance, I was keen to get down to the Incline level. And there is was, the view I was waiting to see. Spectacular. 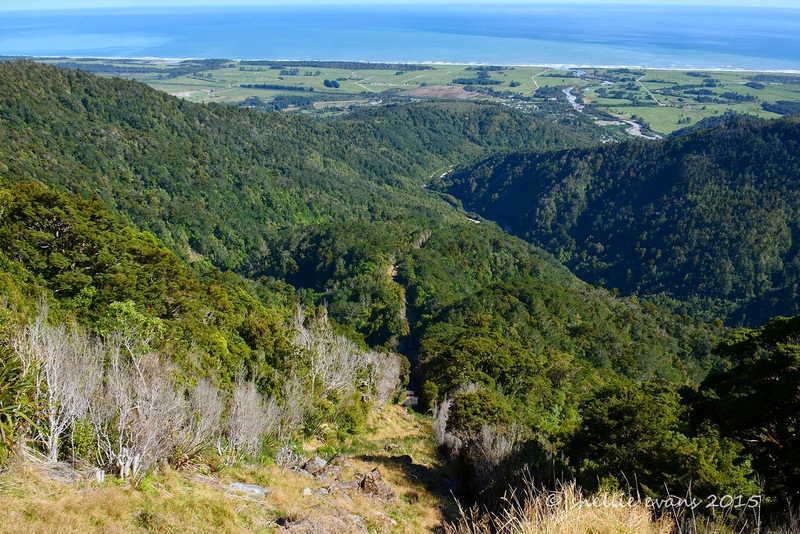 The plateau overlooks the coastal plains of the Karamea Bight and the mouth of the Waimangaroa River. And there, finally, was the poem I had been waiting to see. 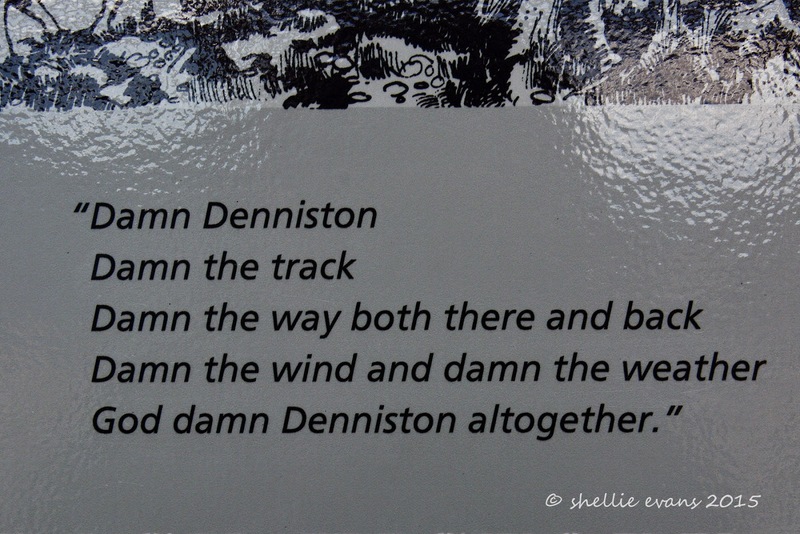 The poem that appears at the beginning of the ‘Denniston Rose’. The poem which had grabbed my attention & imagination and has remained with me. The poem that I copied into a journal and thought I’ll visit there one day. A poem that reflected how tough life was for our early miners & pioneering women. We approach the top of the Incline. Back in 1878 there were many challenges to be faced when coal was discovered on the plateau. One was how to get workers up the steep bluffs that soar 518 metres above the coast, the other was to get the coal safely down. The plan was to drop coal filled wagons straight over the side on rail tracks. 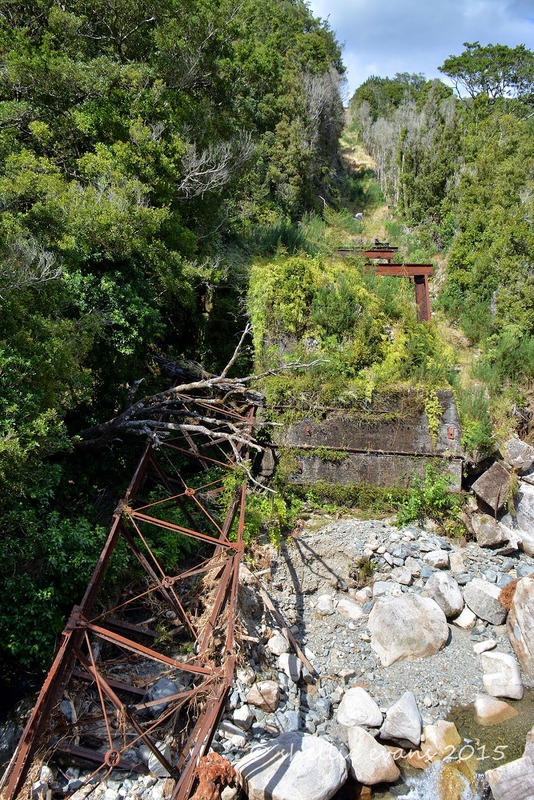 The wagons were paused at Middle Brake, a 253 metre vertical drop to the mid-way point before they were dropped a further 263 metre vertical fall to the bottom, at Conn's Creek. The total distance traveled was 1.6kms. 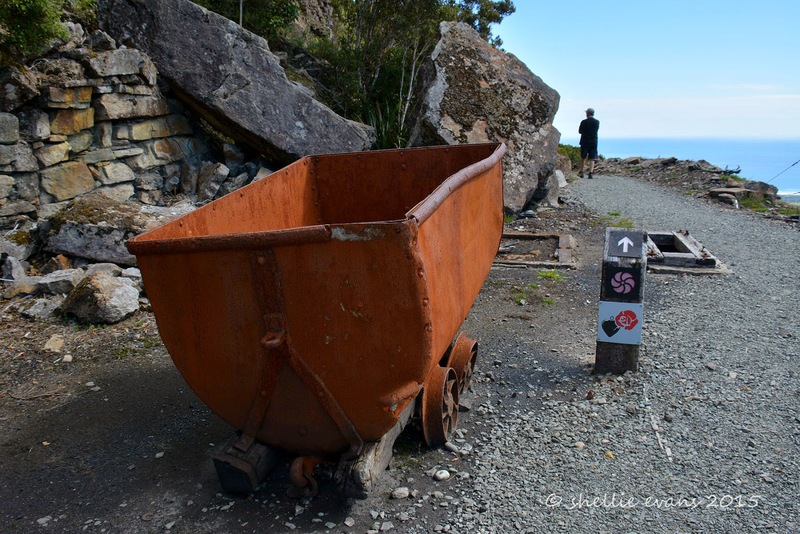 The weight of a full wagon dropping over the side brought up the empty wagons from below. These were frequently used as a 'lift' for workers & families and their household items. 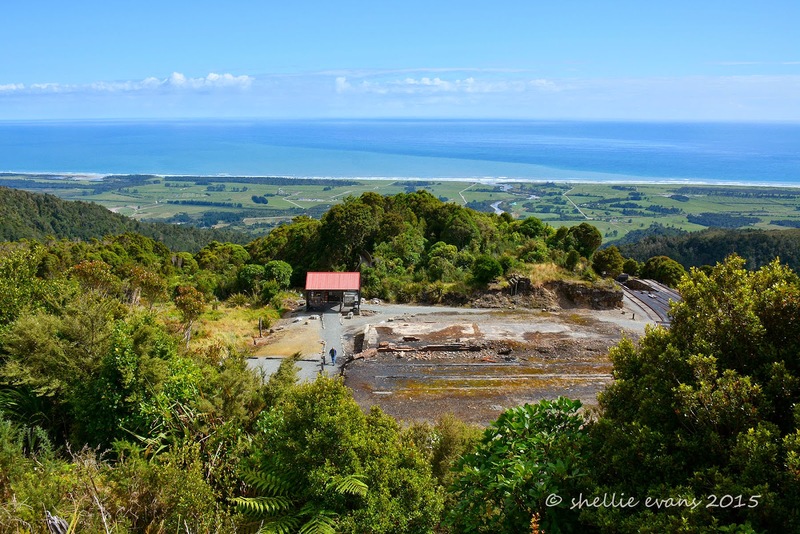 Although extremely dangerous to travel on, compared with the climb up the bridle track it was well worth it. A Q-class hopper wagon ready to drop. Looking down the famous Incline, which doesn't actually look too steep from here. But believe me it is. The coal wagons came to a halt in the first white patch (now a carpark) in the valley below. 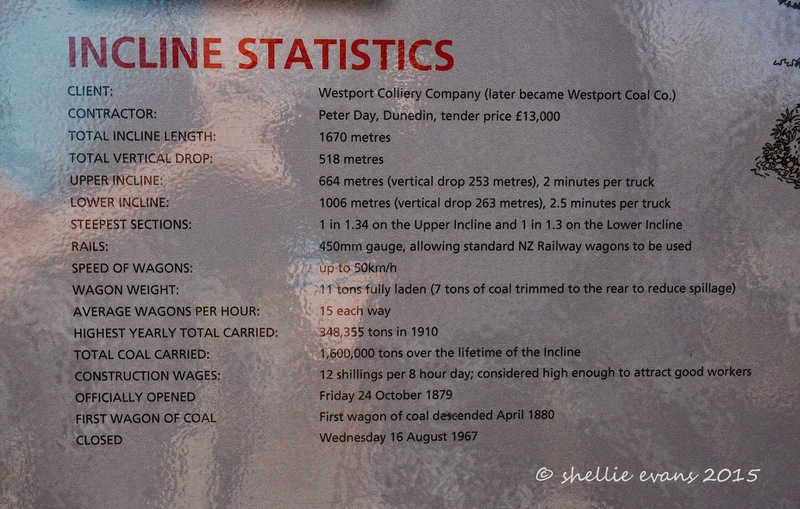 The coal carried on along rails to main railway at Waimangaroa (the settlement at the bottom of the bluff) It was then carted to Westport and loaded into colliers for shipping overseas. Looking back up to platform from where I took the incline photo above. Back up on the Brakehead; the information panels have photos of how it looked before and showed a red spot where you would have been standing then. It was fascinating & also hard to imagine the buildings that filled the platform in front of us (click to enlarge) and to think that many of the buildings and houses remained here until the 1980s. Although they stopped using the Incline in the late 1960s- road transport had taken over. 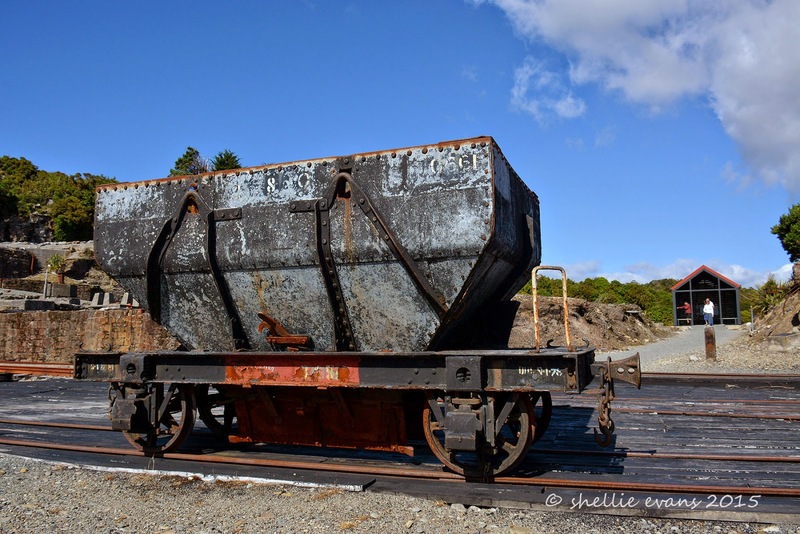 There were a number of old coal wagons made of various materials and in different shapes that had been used over the years. I couldn’t get enough of the wagon about to drop over the incline. To think that many people rode the wagons to the bottom, and quite a few lost their lives doing it too.